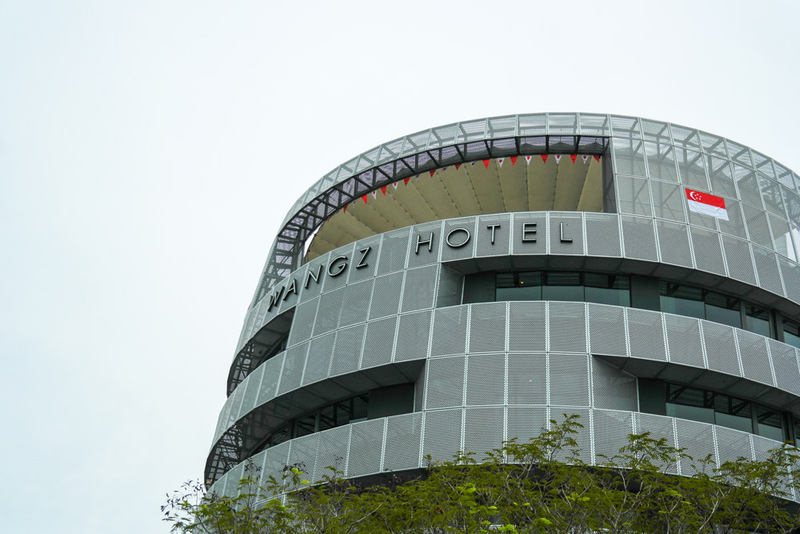 Opened in 2009, Wangz Hotel offers exquisite style and spacious guestrooms for a personalized stay. 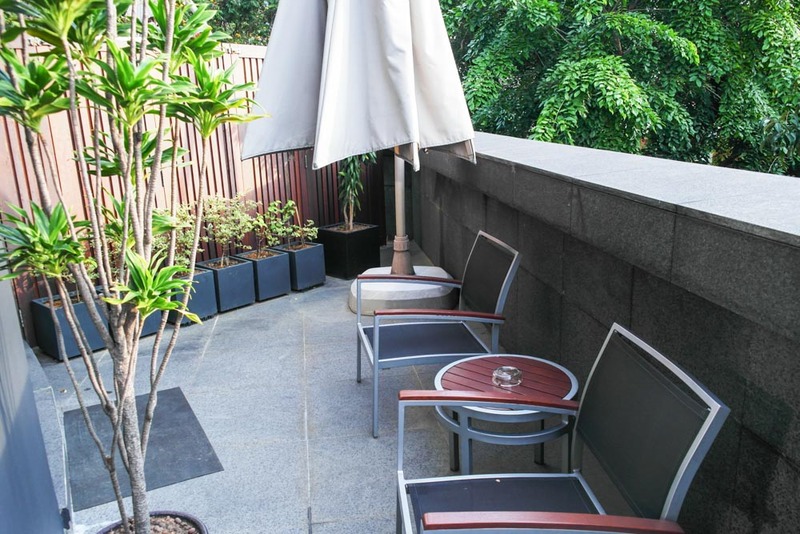 This boutique hotel offers comforts of a 5 star hotel, but strictly speaking cannot be labelled as such as they do not have the required facilities. A dramatic sculpture of aluminum cladding with asymetrical wide windows the setting is sophisticated and celebrates striking architecture in the vibrant Tiong Bahru area. 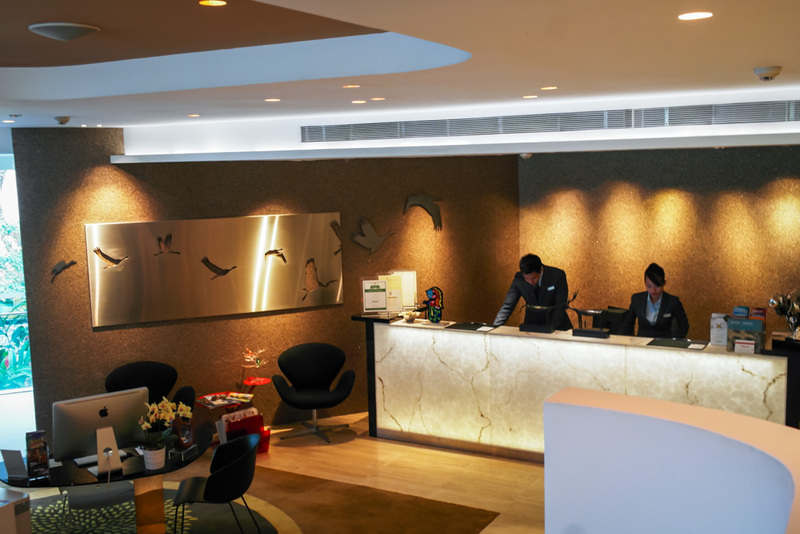 The hotel lobby although small, still exudes a certain luxury. 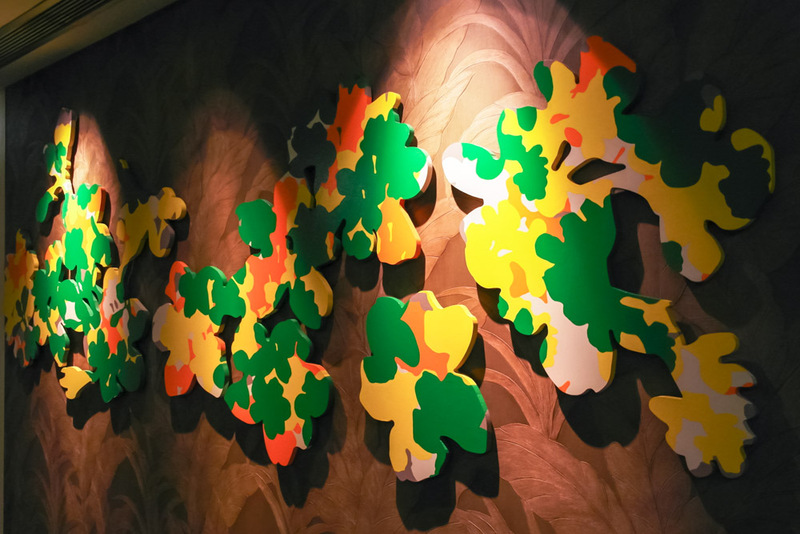 There are various private collection artworks all around, most of which reflect the floral and nature themes of the hotel despite being in a huge metal cylinder. 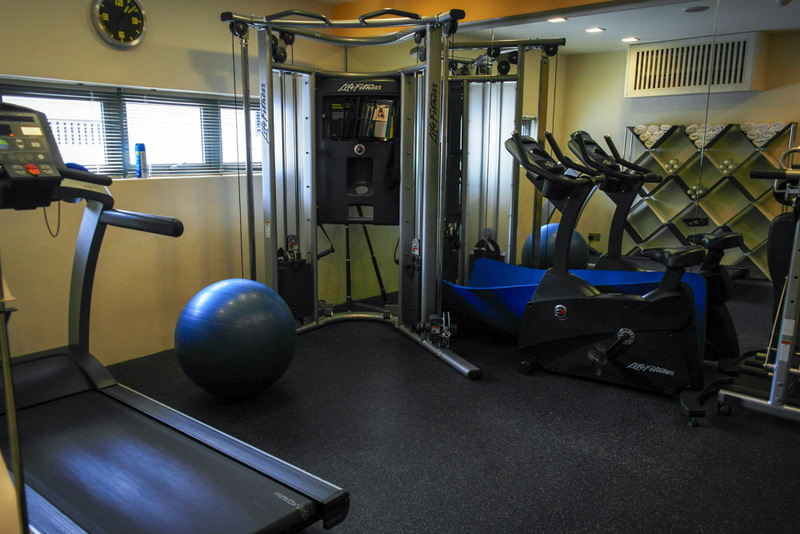 A small gym is also available for the fitness junkie, although you won’t get much to play with. 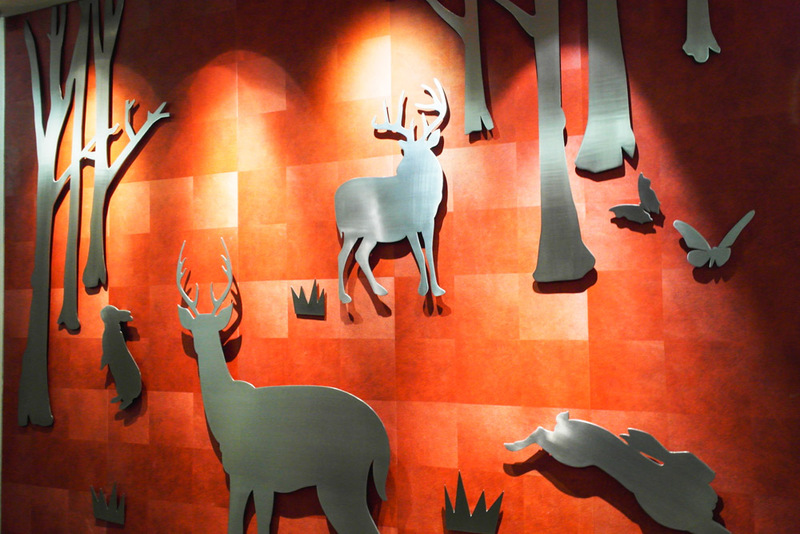 Each floor has a set piece artwork to welcome your arrival. This was my room for the night. The Canopy room is accented by soft palettes of soothing tones, complimented with commissioned art pieces around the plush king size bed. 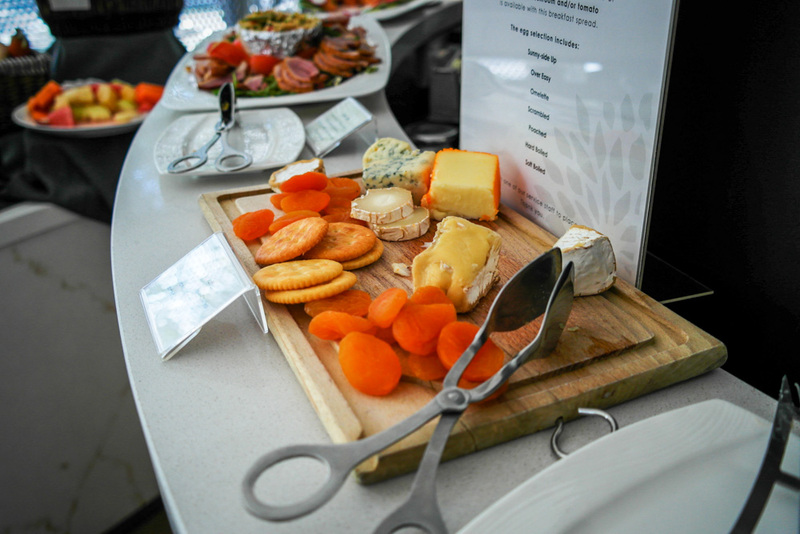 There is also soft, lounge music being played in the background constantly to help you relax. Before tax, the best available rate for the Canopy room costs $295. A spacious modern toilet barred by metal grills. 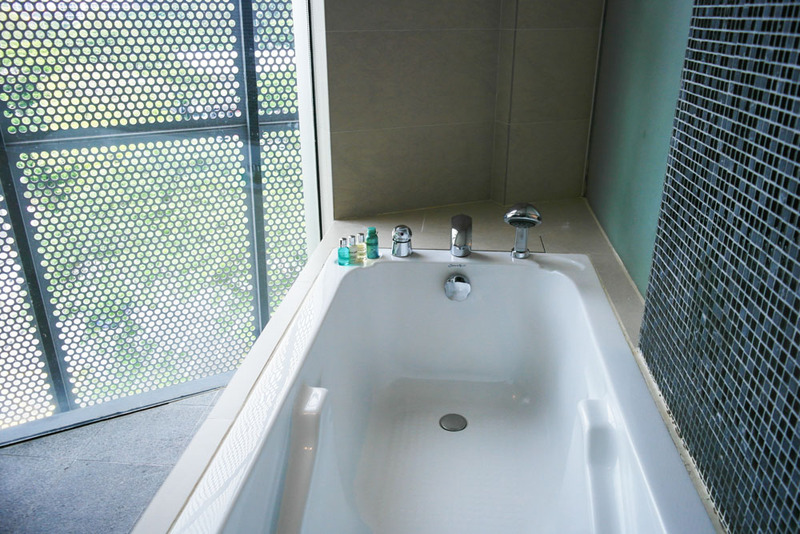 Blinds can be drawn so don’t worry a thing while you indulge in a bubble bath. 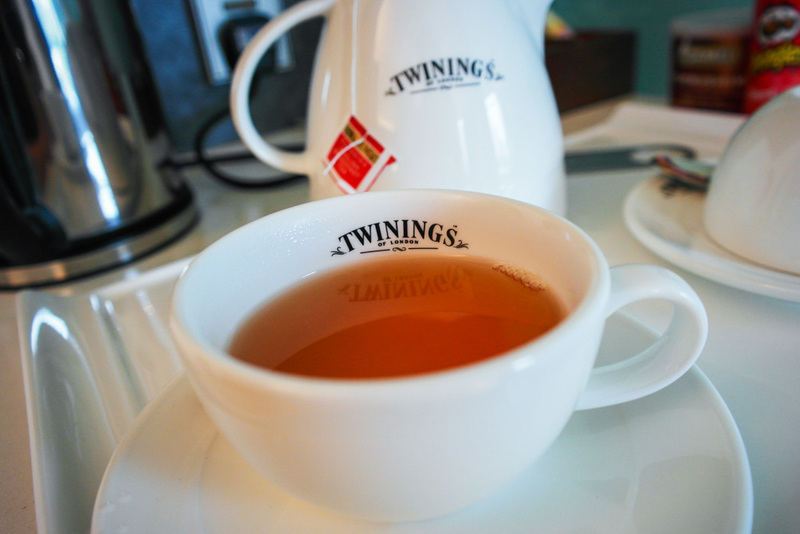 Selected complimentary beverages like Twinings tea and soft drinks are also available in the rooms. I was also brought around the hotel to explore a few of the other rooms, like the standard superior room. What was surprising to me was that the room itself was actually still rather large and spacious! 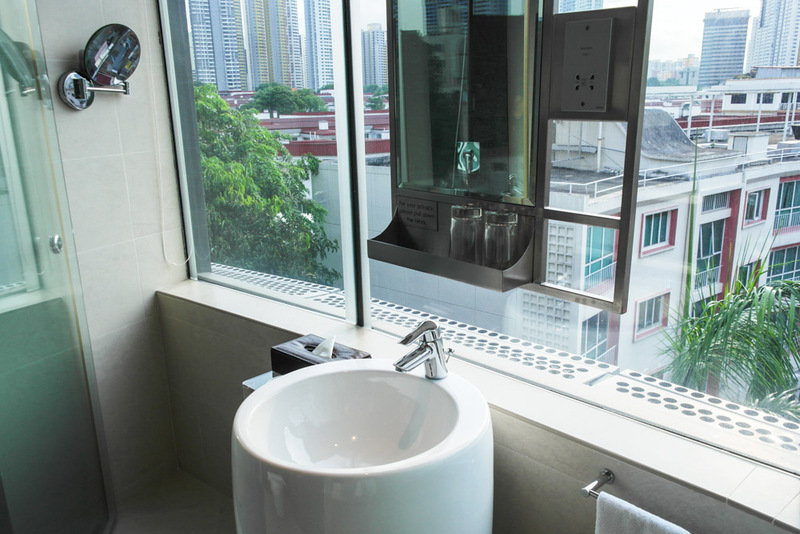 Wangz Hotel concentrates their room space on the bedroom where guests spend most of their time anyway, and cut back a bit more on the sanitary area space. That actually makes a lot of sense. 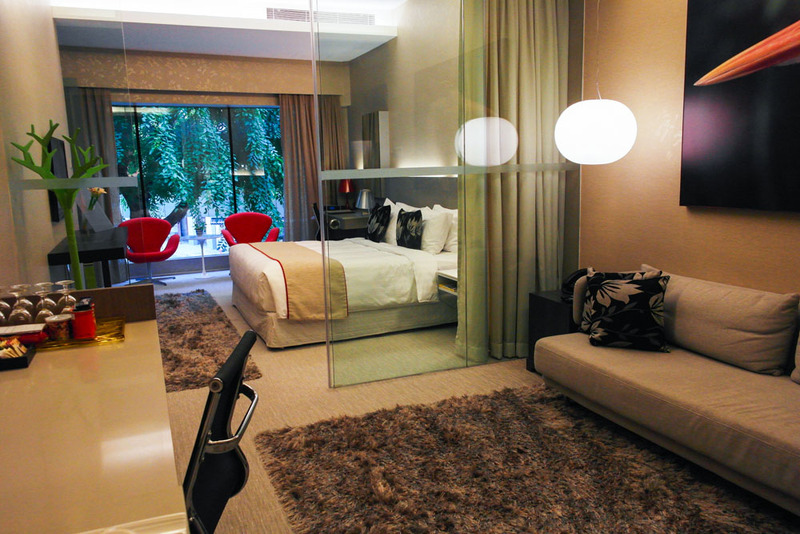 Wangz Hotel’s ultimate indulgence for hotel guest is their 5o6 sq ft. premium Deep Suite room. The multi-functional living space features a separate living room with a queen sofabed as well, perfect for families and travelers with a need for private discussions. 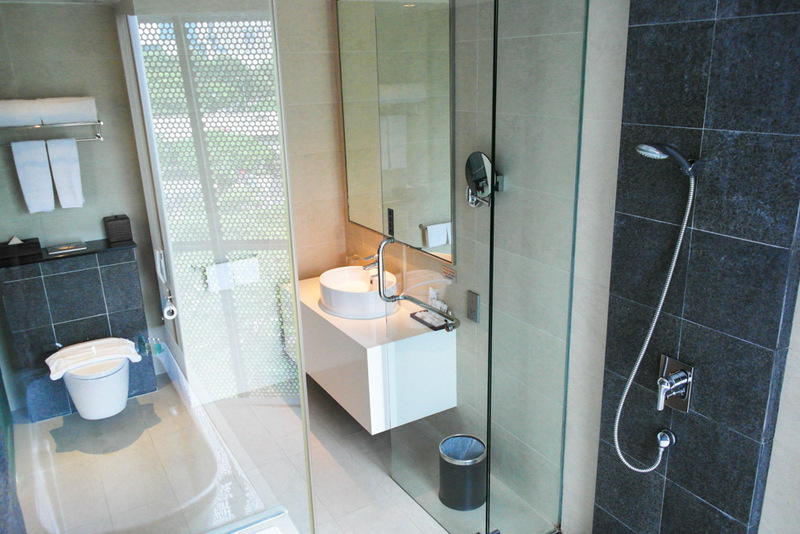 This modern homey affair also features a rain shower with a view of the city. 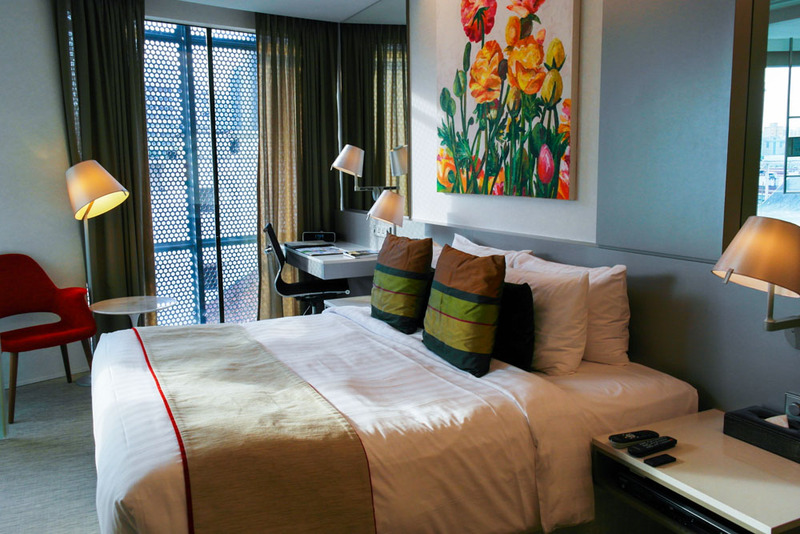 The best available rate for the Deep Suite room starts from $395. Some other rooms like the Balcony room are conjoined, and can be connected via the balcony if both rooms are booked (the fence will be unlocked). 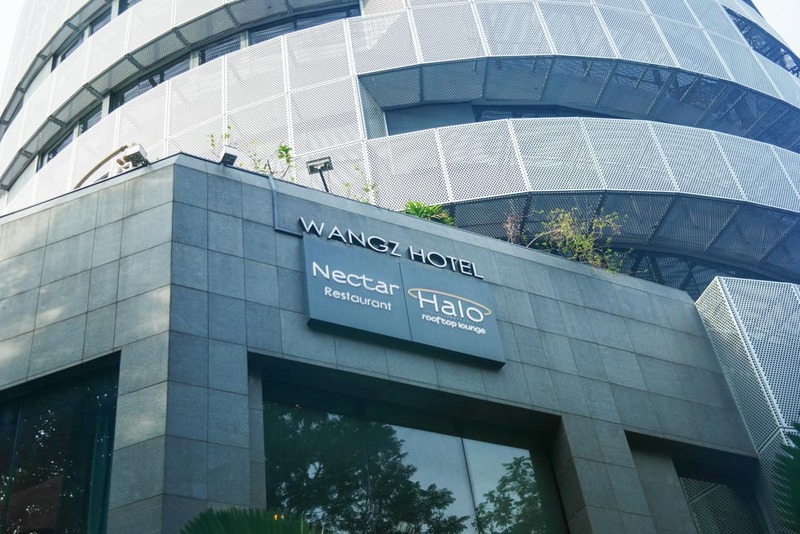 Connected to Wangz hotel’s lobby is Nectar, their in-house dining restaurant. Floral motifs on the rugmingle with the juxtaposition of red black and whie designer chairs, again emphasizing the hotel’s nature theme. 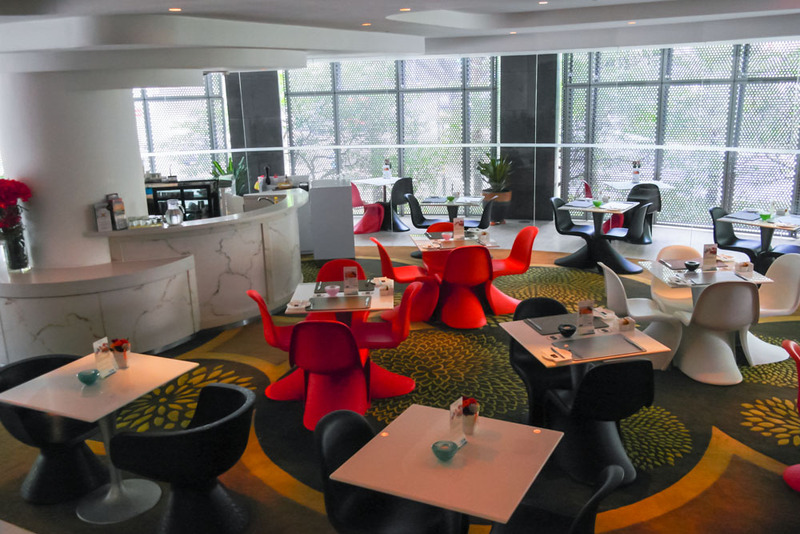 Nectar is an all-day casual dining restuarant featuring modern fusion cuisine to contrast the array of local food found in the nearby eateries around the hotel. Caprese Salad ($12). 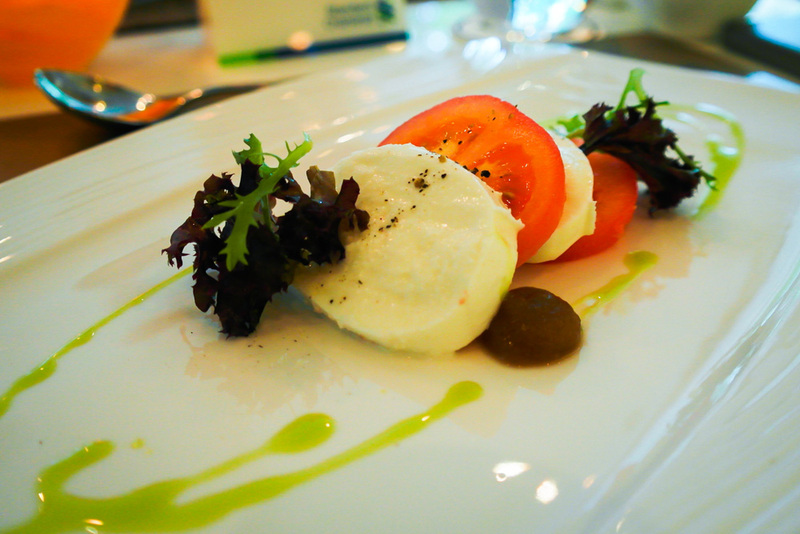 With Buffalo mozzarella, roma tomato, home-madeapple balsamic sauce and mesclun salad. Cannellini Bean Soup ($7). Cannelini bean, spinach and crispy bacon. The beans itself didn’t have much flavour which was compensated by the crispy bacon, although the graininess of the beans added some texture. Pan-Fried Tilapia ($25). 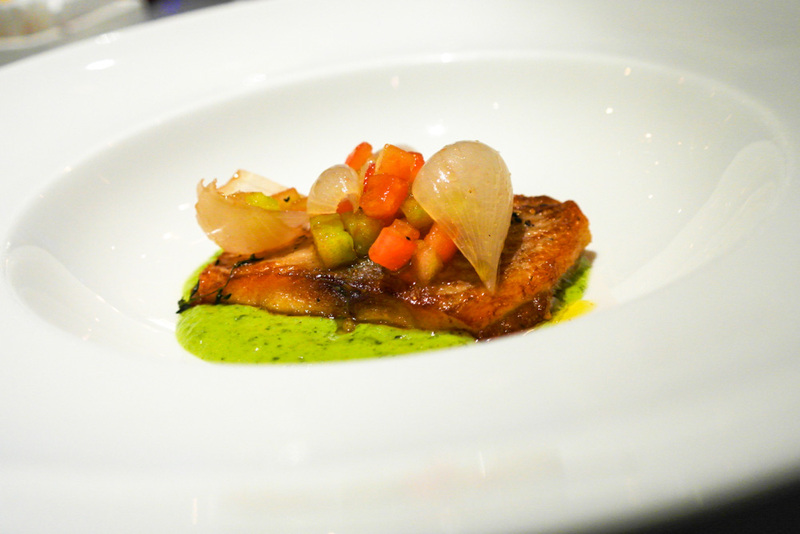 Zucchini Puree, tomato, onion confit. Well-cooked and balanced. Grilled Beef Tagliata ($35). 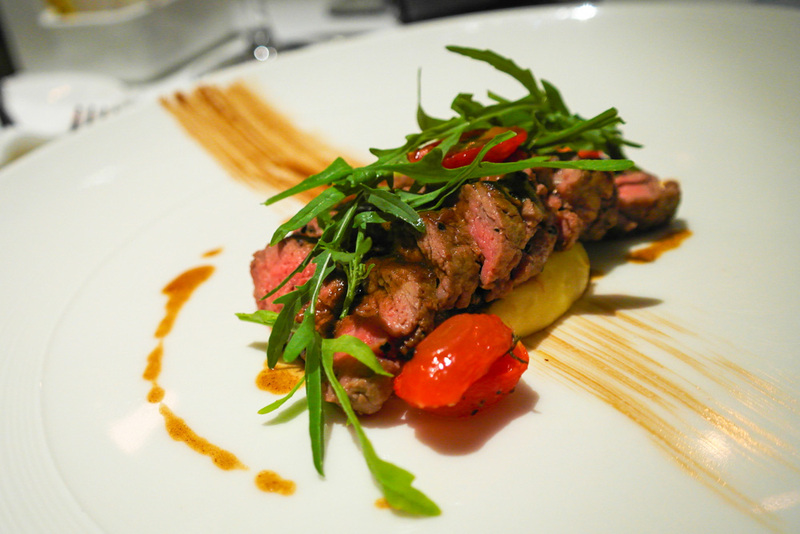 Beef tenderloin, arugula, cherry tomato, parmesan cheese, potato and baslamic reduction. This Italian dish was definitely the highlight for dinner. Despite being cooked close to medium well, the beef was still absolutely tender and had a sustained beefy finish. 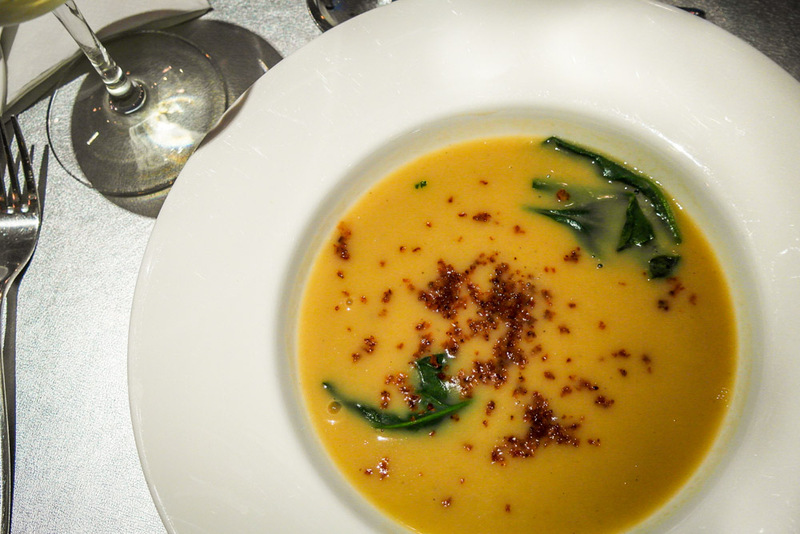 The potato puree it sits on is also buttery and cheesy, the type I like. Chocolate brownie ($10). 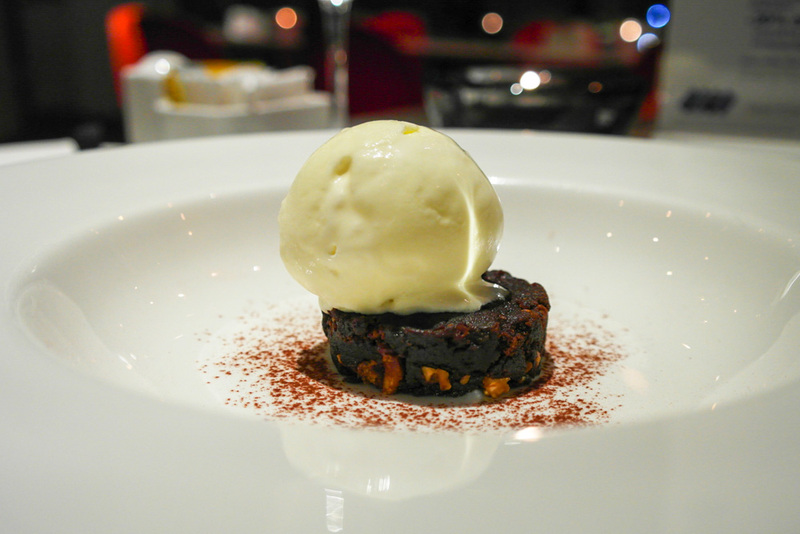 The brownie had a deep caramelization on the walnut which almost tasted like popcorn, but bordered on being burnt. It was a tad too moist for my liking as well. 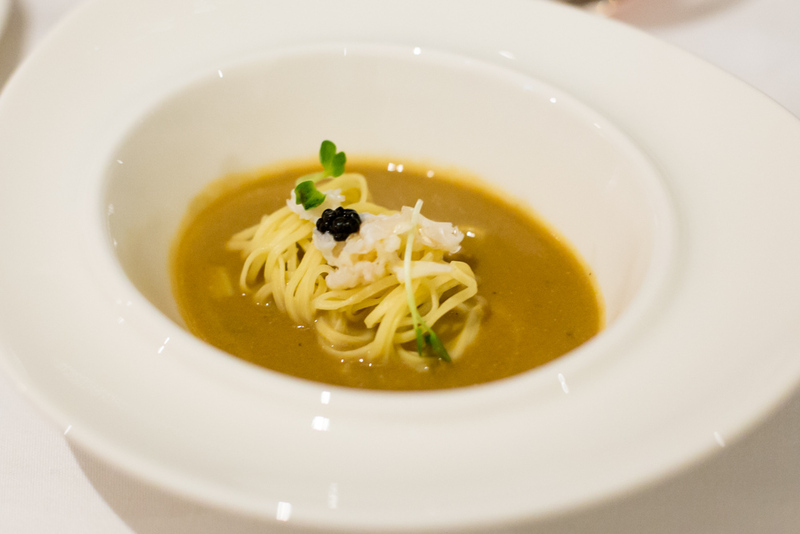 Note that the dishes are in tasting portions and smaller than usually served. 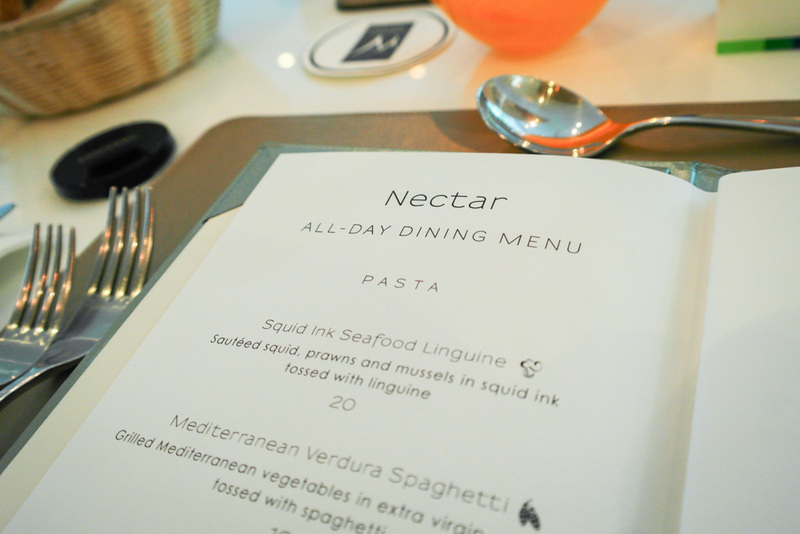 A pretty decent affair for the lazy traveler who wants to dine in a clean environment just within the hotel, you can check out Nectar. Dishes came out a bit on the slow side though, so expect some wait. 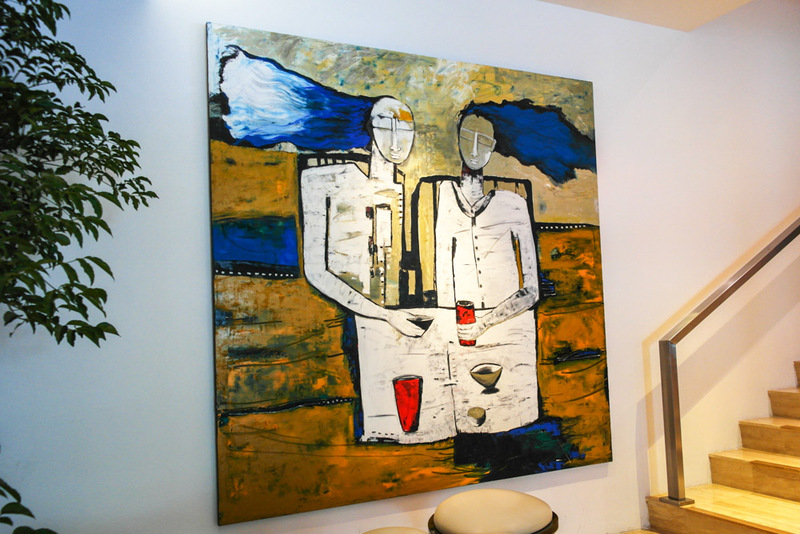 I would recommend checking out the neighborhood area at least once during your stay here as there are several good dining establishments in Tiong bahru. After dinner, you can head up to Halo Rooftop lounge for some post-dinner cocktails. 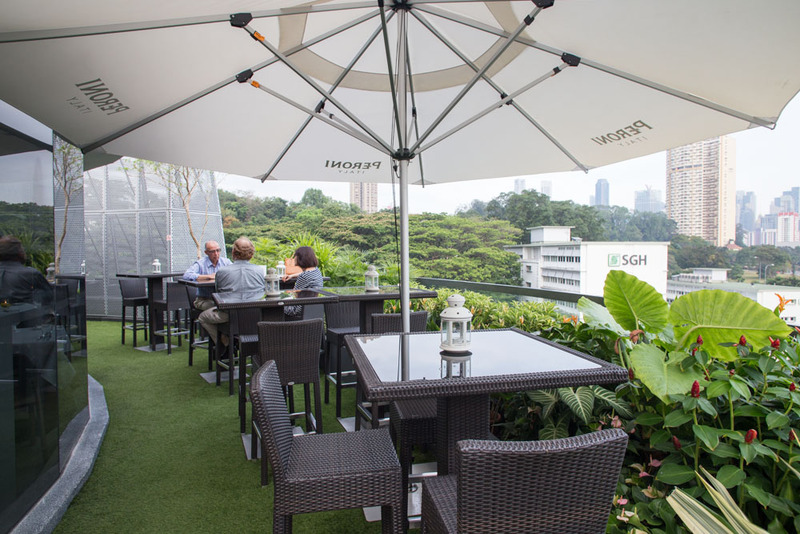 A panoramic view of the Tiong Bahru neighborhood is a highlight at The Rabbit Stash at the rooftop of Wangz Hotel. The curved facde of the hotel frams the distant view of the city skyline in a spectacular sight. 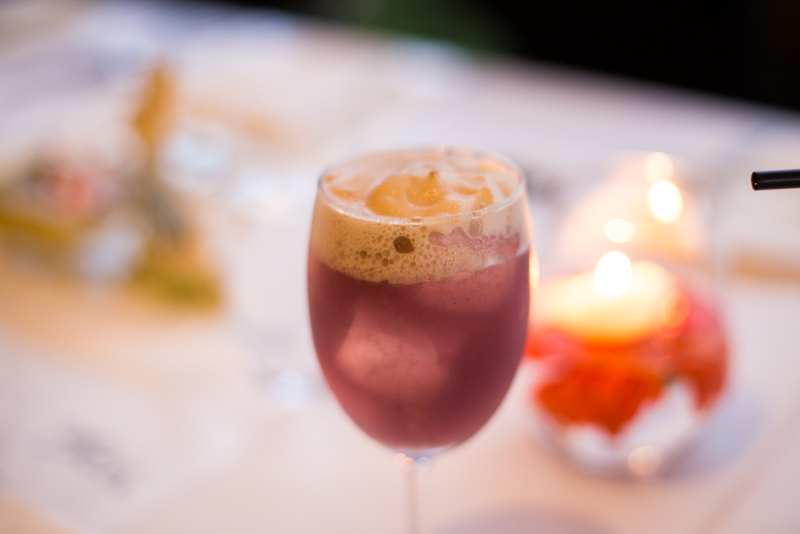 Other than a fine selection of drinks and cocktails, The Rabbit Stash also serves a fine-dining gastronomical journey of food to tantalize the palate through culture and history. Read our full review on The Rabbit Stash here. 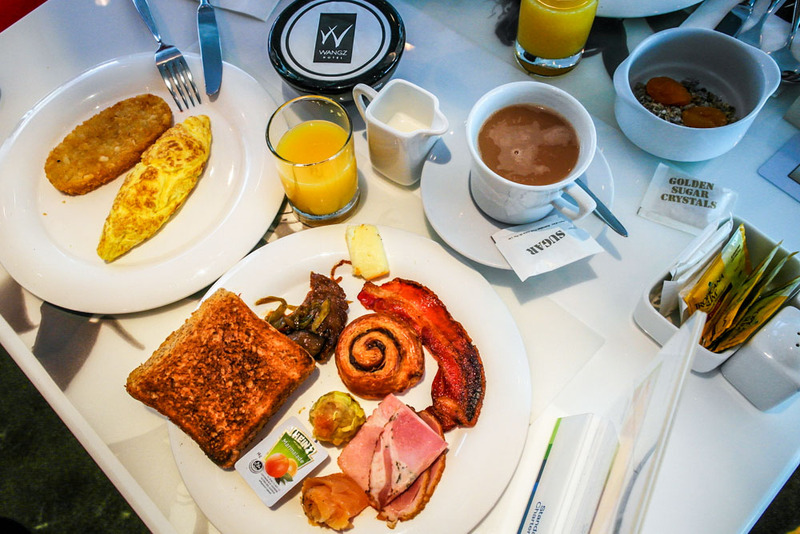 Back at Nectar in the morning, the hotel offers a small spread of items for guests. Really a mix of Asian and European delights. Not a huge variety, but definitely enough to start off your day. Eggs can also be requested to be done in the kitchen in various styles depending on your preference. Wangz hotel’s concept of maximizing the bedroom space given the limited amount of land in this prime property deserves credit. 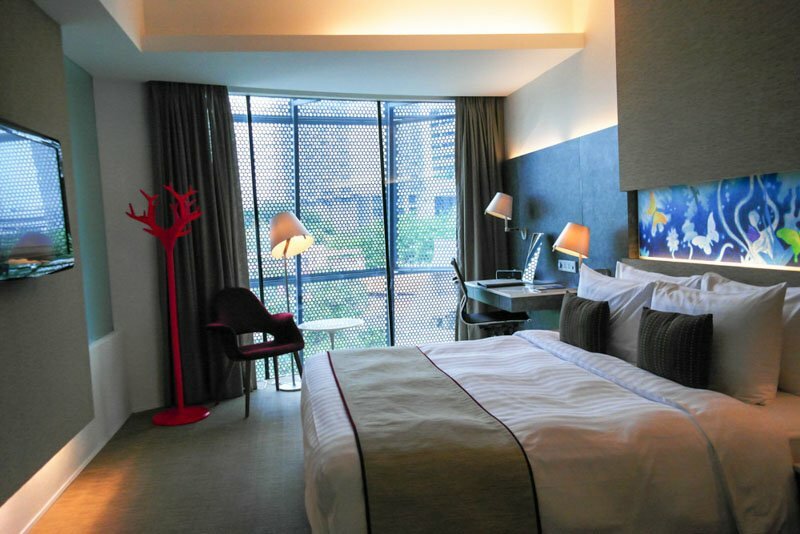 The rooms are perceived to be a lot more spacious than many other small boutique hotel due to their well-planned area, which has a comforting after effect. 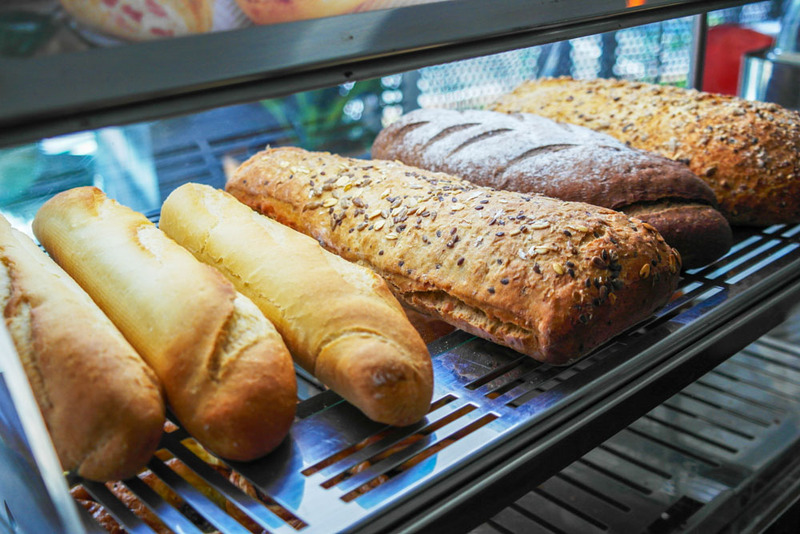 The eclectic Tiong Bahru neighborhood is also filled with cafes and eateries within walking distance from Wangz Hotel, so you don’t have to worry about food/coffee. A good bet for the sophisticated traveler.